As Dale Andrews and I worked on The Misadventures of Ellery Queen, I found myself reading a lot of nonfiction books about EQ, including Joe Goodrich's Blood Relations, Fred Dannay's second wife Rose's My Life With Ellery Queen: A Love Story, Mike Nevins' The Art of Detection, and Crippen & Landru's The Tragedy of Errors, which includes three of the five Puzzle Club stories Dannay and his cousin Manny Lee wrote during the late 1960s and early '70s, shortly before Manny's death, which after half a century put an end to their EQ partnership. As I read the Puzzle Club stories -- and steeped as I was in Queenian pastiches, thanks to Misadventures -- I found myself thinking that it'd be fun to write a new Puzzle Club story myself. I had an idea that had been kicking around the inside of my head for quite some time but that I hadn't yet found a way to work into a story, and that idea seemed right for a new case for the Puzzle Club. My initial thought was to set the story in the early 1970s, when the Puzzle Club was initially active, but at the same time Dale and I were working on Misadventures I was also looking forward to the publication of "50" in the November/December 2018 issue of EQMM, exactly half a century after the appearance of my first published story, "E.Q. Griffen Earns His Name", in the December 1968 issue. I set "50" in the present day, making E.Q. Griffen fifty years older than he was when first we met him, and it seemed logical to do the same for the Puzzle Club ... which would make Ellery, Syres the multimillionaire, Dr. Vreeland the psychiatrist, Darnell the defense attorney, and little Emmy Wandermere, the Nobel Prize winning poet, very old indeed. In the original five Puzzle Club stories, the group also has a sixth member, biochemist Dr. Arkavy, who is referred to but never appears, and I thought it would be interesting to have him show up at last for this new tale. I also brought back Syres' chef, Charlot, and added one new character, Charlot's son Charles -- pronounced Sharl, a la Francaise -- in the role of Syres' butler. And, although I don't want to spoil the ending of the story, I'll mention here that, in addition to being a Sherlockian pun, the title also has a hidden Easter Egg of a meaning. Anyway, I wrote the story and submitted it, and EQMM editor Janet Hutchings bought it. Even before I'd signed the contract, I came up with an idea for a second Puzzle Club pastiche, and it seemed logical to me that, if I was going to write two of them, I might as well go ahead and write five of them, matching the original five. I asked Fred Dannay's son Richard how he'd feel about an eventual book containing the original five plus my five, to be titled The Puzzle Club and credited to "Ellery Queen and Josh Pachter," and he liked the idea. By the time "A Study in Scarlett!" 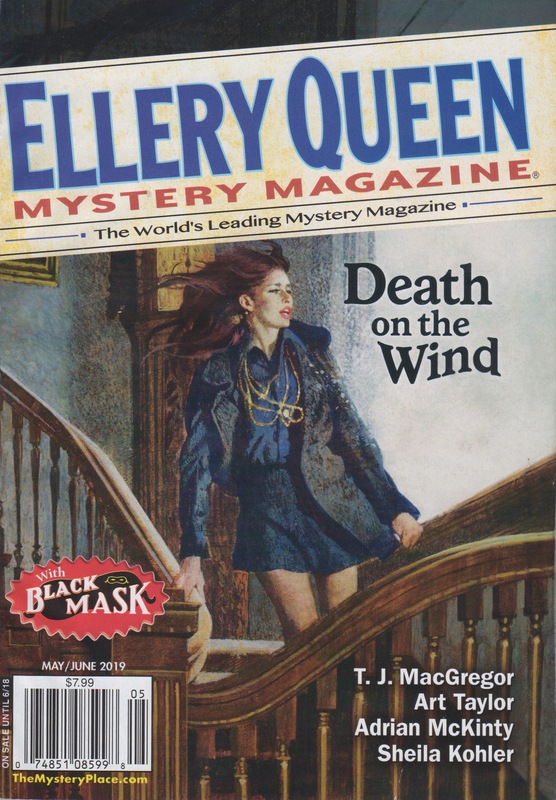 appeared in the May/June 2019 issue of EQMM, I'd already sold Janet the second story, submitted the third, and first-drafted both the fourth and the fifth. Janet doesn't want to run them too close together, though, so I'm spacing out submitting them, basically one every seven or eight months. Since the first story's title is a Sherlockian pun, I thought it would be fun to make all five titles Sherlockian puns ... and, since the first one puns on a Sherlockian title that includes a color, I thought it would be fun to make all five titles Sherlockian color puns. With that in mind, the second one is called "The Adventure of the Red Circles" (which comes from Conan Doyle's "The Adventure of the Red Circle"), the third one is called "The Adventure of the Black-and-Blue Carbuncle" (see "The Adventure of the Blue Carbuncle"), and the fourth one is called "The Five Orange Pipes" (from "The Five Orange Pips"). For the fifth and final story in the series, I considered "The Adventure of the Yellow Facebook" ("The Adventure of the Yellow Face"), but ultimately decided that -- since I wrote it to be the last possible Puzzle Club story anyone can ever write -- I'd skip the color and simply call it "Their Law Bow" (after Conan Doyle's "His Last Bow").